Paper mache is a craft that involves molding shapes by layering strips of paper with a paste that is usually made of flour and water. After a layer dries, you add another, and soon you have a solid and sometimes flexible shape. Pinatas are intentionally hollowed paper mache objects made for breaking. You can also cover a solid object with paper mache for a more solid and long-lasting object. This is a fun project for children. Blend together a cup of flour with two cups of water.The mixture should resemble a slightly runny paste, so add more water or flour as needed to reach the right consistency. Rip the recycled paper and newspaper into half-inch wide strips. Rip them by hand rather than using scissors to cut them; the ripped paper fibers will make a stronger mold. 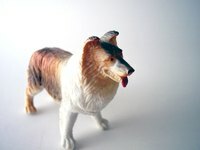 Clean and dry used animal toys or figurines. Start with a toy that's about 6 inches to 10 inches tall. Once you're comfortable with the process, you can work with smaller and/or larger objects. Protect a cloth animal toy or one you're using for a mold only by covering it completely in plastic wrap. Tuck the plastic wrap in tightly so the shape of the animal is clear. Dip the paper strips into the flour/water mixture and layer them on top of the toy. For a project in which you plan to cover the toy completely, apply a layer all the way around the toy and set it aside to let it dry. For one where you're only using the toy as a mold, cover only half of the toy and let the layer dry. You will be applying five layers in total. For a mold-only toy, turn it over and repeat all five layers on the other side. Connect the two paper mache halves with more strips of flour/water paper. Decorate the toys with paints, stickers, and recycled objects for a finished look. Keep an eye on small children,s as they may try to eat the paper mache paste. It won't hurt them, but they won't like the taste.